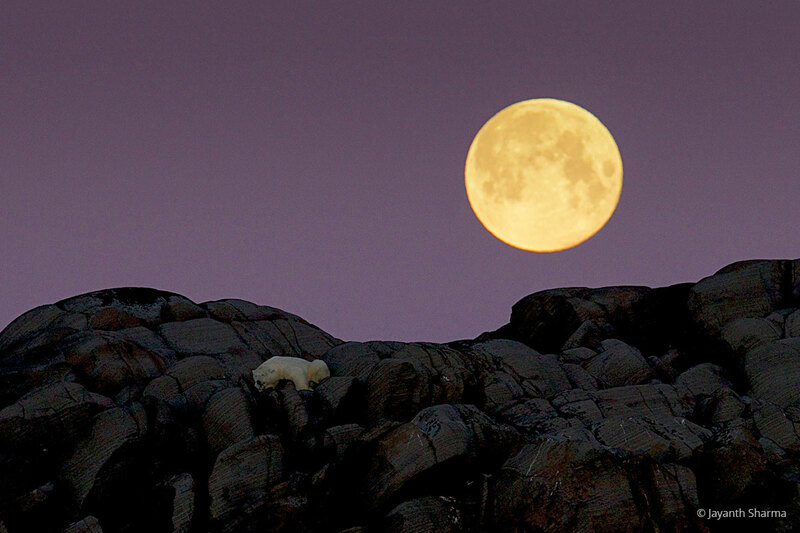 I have always been fascinated by the polar bear as it is the largest living carnivores on the planet. The fact that is even more fascinating is that it is a marine mammal. My first encounter with the polar bear has always been a fond recollection for me. In 2011, I travelled to Churchill, a small town by the Hudson Bay in Canada, and ever since I saw this majestic bear, I have been in love with it. But it was only when I first visited Svalbard in Norway that I experience viscerally and so realised what an amazing habitat and landscape it is for the polar bear. And since then, I have been travelling to this edge of the earth year after year. 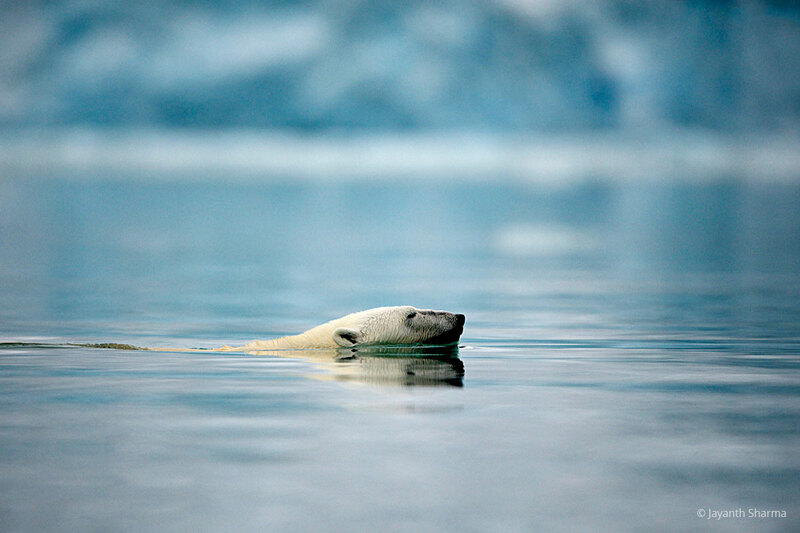 80 degrees north in the icy Arctic world lies sprawled its most luminous pearl called Svalbard. Being in the northernmost part of Norway, it is an immense archipelago in the Arctic Circle, not far away from the North Pole. And it is one of the few places on the earth where man is even today subordinate to the laws of nature, the wild remains untamed and the idea of infinity suddenly seems as real as it can get. Snow-capped mountains stand tall with glaciers in their laps, picturesque fjords bearing azure icebergs and drift ice cut prettily through the land; and wildlife thrives everywhere â€“ under water, on the surface and in the air to remind you that this is not a desolate wilderness after all, but a living, throbbing wonderland. And in my opinion, the most extraordinary place on the earth to see and photograph the polar bear is Svalbard. In winter, the sea is frozen, but in summer, the ice cracks and makes way for sailing. The place basks in light for all of the 24 hours and the midnight sun is quite a dramatic thing to see. And photography becomes that much more remarkable than usual, too. Without an ounce of exaggeration, seeing and making images of the polar bear in blue ice is a surreal experience that is one of its kind. Every year, as co-founder and CEO of Toehold Travel and Photography, I take a bunch of wildlife photography enthusiasts along with me to Svalbard on an expedition to photograph the polar bear and the other mammalian and avian creature. We use a small ship for the expedition. While photography is done from the deck of the ship, we also use two inflatable boats called ‘Zodiacs’ that ferry us ably, also allowing us to photograph from lower angle and offer closeness to wildlife. While on the ship, we have our own chef who is skilful at international cuisine to meet individual requirement. So even when you consider all the minute but necessary daily details, being in Svalbard is a scalable adventure for a nature lover. Although the polar bear happens to be the main attraction in Svalbard, a wildlife enthusiast is bound to experience sensory overload because the place is also home to exotic animals such as the walrus, the seal, the rein deer and the arctic fox. Different species of giant aquatic mammals like the humpback whale, the fin whale, the beluga whale, the mink whale and the monumental blue whale are also some of my favourite animals in this wonderland. Among birds, I have taken enormous joy in watching and photographing the incredible charm of the arctic tern, the puffin, the gull, the skua and the guillemot. One of the best parts of exploring Svalbard is that there is never a fixed itinerary. Every evening, we have to refer to satellite imagery of ice maps and then decide where to head next. It is only years of experience and an intimate knowledge of the place that help me live viscerally the dream-like place that Svalbard is. 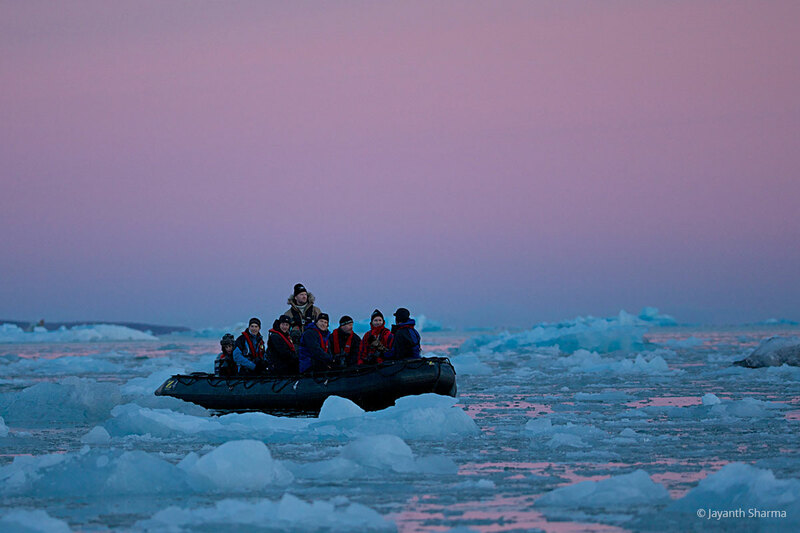 In my experience of travelling across the globe â€“ from the Arctic to Antarctica â€“ Svalbard has remained one of the places I wish to revisit again and again with an increasing love and reverence it duly demands. It’s the kind of sensory overload that I willfully treat myself to, to rich experiences that know how to only commence at only this edge of the world.